This past year, this wooden Boston pencil sharpener remains one of my favorite thrift store finds to date. And although I haven’t found many this year, they’re relatively common and generally pretty desired by collectors and antique decorators. Like I mentioned in my earlier post about the history of the Boston Pencil Sharpener Company, the company was founded in 1899. In 1913, their sharpeners (like the one pictured above), were selling for about $6. Before then, people were more accustomed to expensive sharpeners or having to sharpen pencils by knife, which wasted the lead. The company was later acquired by Hunt Manufacturing Company in 1925, and X-ACTO bought Hunt’s Boston sharpener line. While X-ACTO retained the same design as the original, many consumers have noted a significant difference in the quality of the mechanisms. And many such consumers still collect vintage Boston sharpeners. I found this sharpener at a local thrift store for $6. Later, I was able to sell it to a buyer online for $30. The buyer was really satisfied with the deal, and I was happy to give it a new home. 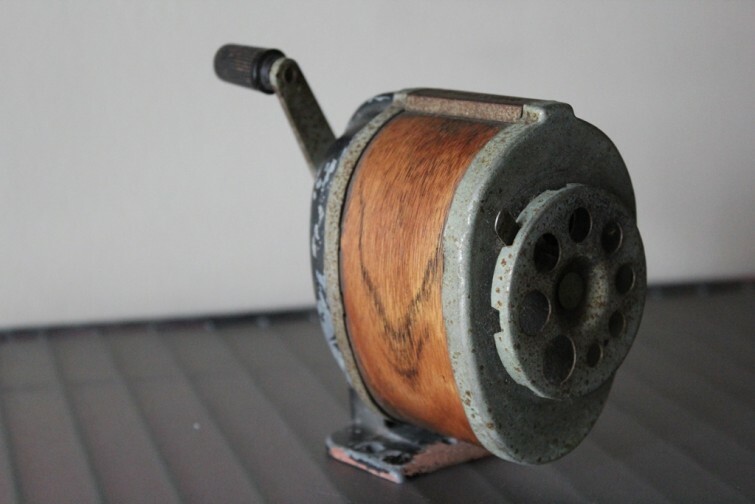 For more posts on vintage pencil sharpeners, click here.